After we finished our afternoon walk in Selati Reserve trying to identify as much animals Tracks and signs, as part of the Tracking Course I was doing in south Africa, we started a discussion with our instructor Colin Patrick, who was one of the best field guides in South Africa, a person with a very high senses for nature. 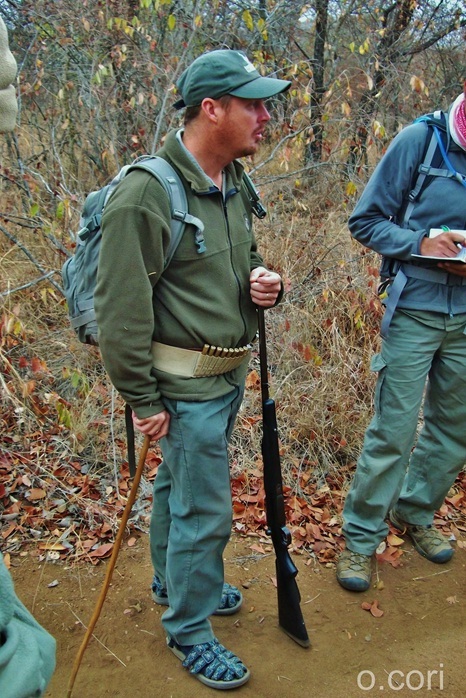 Colin started “it is very essential for the tracker to think in a different way, to feel all the components of the nature around him and be open in his explanation of the animal behaviors that left behind the tracks and the signs he is trying to interpret”. “One important aspect a tracker should not forget, and it can make all the difference between finding the animal you are tracking or not, is the unnatural noise that we make.” Colin added. He then looked at one of my colleagues, garbed his back bag explaining, “ the bags we carry for example, many pieces going out of its body, some metal pieces hanging from it, and too much friction, the noise of friction is not natural to animals, though it will scare them away. Even our clothes do make a lot of noise, certain fabrics can make too much noise, though we should be careful choosing our bags and our hiking clothes.” He then asked us to take off our back bags and put them a side. “One big barrier between us and the wild life surrounding us are these shoes we are wearing. Look how antelopes moves in the wild, he takes the front limp off the ground to put it forward and then moves the hind limp to fall right exactly on the same place the front was before, they recognize that walking can make a lot of noise that will get their camouflage reviled, they avoid breaking more twigs or crashing more dry leaves on the ground, since shoes protects our feet, now we stop paying attention for what we step on, we become less carful in or way, not only that, but it will give you the feeling of the ground, t same feeling that the animal get when it is walking, giving you a better imagination and understanding for where the animal next step will be.” He added again. We all then took off our shoes. We went in a small walk around to see how this can affect the acceptance of our existence by the surrounding animals. The results was surprising how close we could get to different birds, and other ground animals without them to flee away, they were no more scared by our close presence, Like if we were accepted as part of the environment and not as a strange body from outside. This experience left many questions in my mind of our connection to our surrounding environment. One of these points was the effect of barefoot in hiking or outdoor walking in general, on the park, the beach or even deep in the forest. A small act that removes many barriers to the natural wildlife, I won’t say it in a loony hippie way spouting sounds about being one with mother earth (It is fine if you are one), but it is the innately human feeling of nature that have been forgotten with the rush of the modern life. Interesting enough there have been many studies conducted on this subject, explaining many benefits giving us all the reason to forget our shoes home next time we go hiking! Knowing that around 40% of the world population are not wearing shoes makes you feel you’re not odd by doing so, even that the reasons are different in both cases. Walking barefoot results in a more natural gait. People who are used to walking barefoot tend to land with the forefoot or mid-foot, eliminating the hard heel strike and generating much less collision force in the foot and lower leg. A 2006 study found that shoes may increase stress on the knee and ankle, and suggested that adults that walked barefoot may have a lower rate of osteoarthritis, although more study is required to elucidate the factors that distribute loads in shod and barefoot walking. A 2007 study examined 180 modern humans and compared their feet with 2,000-year-old skeletons. They concluded that, prior to the invention of shoes, humans overall had healthier feet. It’s hard not to pay attention to every step when you’re walking barefoot. You have to be on the lookout for sharp rocks and thorns. Awareness of what’s in front of you in this moment quiets your inner chatter and clears your mind and helps you focus on the here and now. 5. Get a Good Night's Sleep.